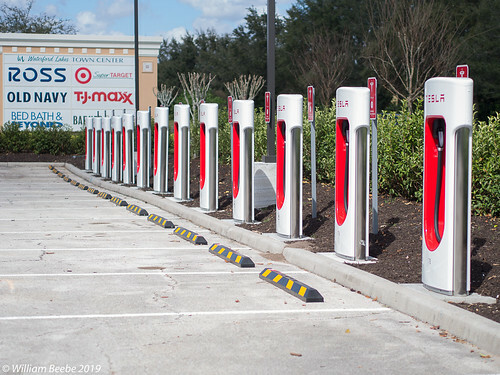 There is now a row of shiny new Tesla chargers in a back parking lot at Waterford Lakes in Orlando. Not being a Tesla owner myself I have no idea if they’re a super-charger. It’s been something of a six month project to get them installed in the second half of last year, and then they were blocked when Waterford Lakes held its traveling Christmas Carnival in that same back parking lot. Why they would put them in such an out-of-the-way location is beyond my mere capacity to understand these things. I’m assuming that you drive your Tesla up to one, hook up the charging cable, then wait for the Tesla’s battery to fully charge. Then you detach, put the cable back, and drive away. 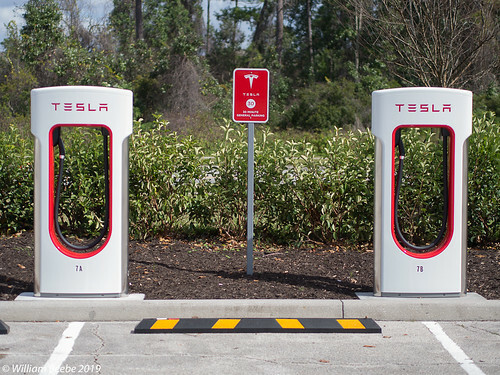 The reason why I wonder why they’re so far in the back is that Tesla chargers have been undergoing a bit of vandalism as of late, as well as ICE (Internal Combustion Engine) treatment, wherein a big honkin’ truck driven by a big stupid redneck parks in a slot and then walks off. But seeing as big stupid rednecks are also a bit lazy, it’s probably a good idea. Otherwise they’d (gasp! horror! shock!) have to actually walk a bit to get to anything in the shopping center. So maybe there is some method to this madness. The sign next to each of the chargers says parking is limited to 30 minutes, so I can only assume that the Tesla will be reasonably charged (perhaps fully) in a half hour. 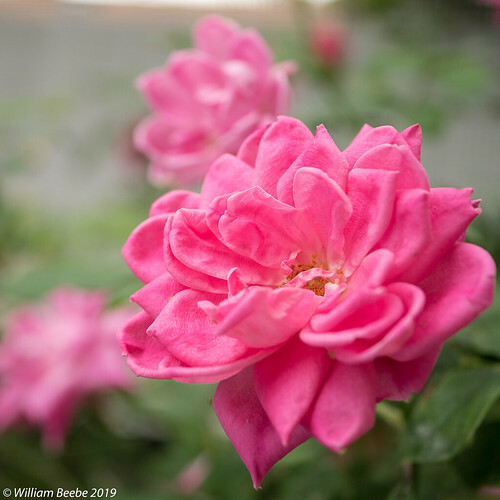 Here is a tale of two roses I photographed, both in my backyard garden. The first one at the top was taken with the Olympus E-M5 and M.Zuiko 45mm/1.8. I imported it into Lightroom, cropped to a square size, dropped the sharpening down -15, and boosted clarity +20. The color is just like the camera recorded, which matches what I saw before I took the photograph. Technically there’s nothing special about the photo. I got as close as I could (the 45mm has a minimum close focusing distance of a little less than two feet; it’s no macro lens) before I took the photo. 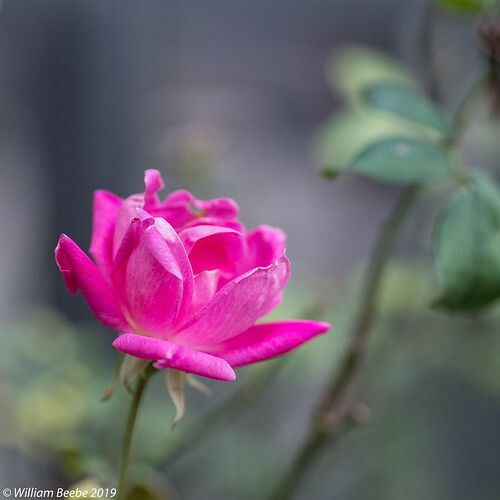 And yet the rose shows beautiful veining and shading throughout, while the background as it falls away grows to a very pleasant dreamy out of focus view. I will say this about post processing. I’ve discovered that Lightroom is too aggressive in its sharpening setting (25 is the default). And running the image through Niks Color Efex Pro 4 will destroy that clean transition between areas of tone and light. I almost dialed the clarity back down to 0 because if its effect on such separation as well. This photograph of those same group of roses is entirely different. Different time of day, different lighting (the upper right before a thunderstorm, the lower in the afternoon), different time of the year (May 2018 vs January 2019 in the first photo). The camera and lens used to take the second rose photo are the Panasonic Lumix GH4 and the Lumix G Macro 30mm/2.8. In post I did the same thing with it that I did with the first photo: square crop, sharpness -15, clarity +20. The Lumix macro is much more closer focusing, and the color science is different in the GH4 than the Olympus. In spite of all that I like both equally well. Past history: I picked up a GH4 last year when Panasonic first dropped the price below US$1,000. It was inexpensive enough I felt I could get a copy, in no small part because I wanted to dabble in video. Well, I dabbled, and that’s as far as it got. But along the way I discovered it was a stellar stills camera, so I began to use it to take photos. If nothing else, it appeared to my eyes the output was more “cinematic.” Unless I’ve really screwed up exposure and/or color balance, I tend to do minimal processing. Otherwise I’m happy with the results. The cameras are three years apart (the E-M5 was introduced in 2011, the GH4 in 2014). The GH4 is far bigger than the E-M5. Their menu systems are radically different. The E-M5 has IBIS, the GH4 doesn’t (that’s why I got the Lumix 30mm; ILIS). And yet, with their 16MP sensors, they produce equally beautiful photography. Both cameras are beautifully designed and built, and fun to use. They thus inspire one to go out and photograph the world. I might not be doing the video I thought I would with the GH4, but I sure do like the still output. You don’t need leading edge, just-released, nose-bleed expensive camera equipment to create pleasing photography. I got that GH4 four years after introduction and one year after the GH5 was introduced. The E-M5 was introduced in 2011. And yet they are both still wonderful cameras. Use what makes you happy. One key path to happiness is to stay away from highly expensive equipment. Buy used. KEH Camera is a great place to start, and both Adorama and B&H sell used, and on occasion open box cameras. Photograph. A lot. Mike Johnston over at The Online Photographer just published seven laws of lenses, in which the Leica Lens Precept says it take a full year to test a lens. That means a lot of testing, by the way. Lots of use. Lots of chances to experiment, mix things up just for the heck if it. Remember that digital isn’t film, so you can take as many photos as you want until you run out of card space or the battery runs down. Stay away from social media gurus. They’ll never view the world the same way you do, which means they can’t create the same images you might with your camera. Keep it small and simple. The E-M5 and 45mm lens are compact and make it so easy to take the camera with you wherever you go. Today’s equivalent would be the Olympus E-M10 mk3 with the M.Zuiko 45mm/1.8. Very portable cameras make it very easy to take photos. Have fun. The most important part of the camera is the user behind it. Don’t let the camera intimidate you. Don’t let the critics intimidate you. Do be careful and use common sense. But above all, have fun.